DM - Cardiology, MD - Medicine, M.B.B.S. Dr. Arvind Kaul, MBBS, MD(Internal Medicine), DM (Cardiology), having illustrious experience of more than two decades, is the Head of the department of Interventional Cardiology at Alchemist Hospital, Panchkula. 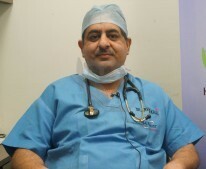 Prior to that, he was associated with various private hospitals in the north zone, Silver Oaks, Cardiac Care Centre, Mohali; Mukat Hospital & Heart Institute, Chandigarh, and Escorts Heart & Super Specialty Institute, Amritsar. After completing his basic medical studies (MBBS), Dr. Arvind pursued his post graduation, MD(Internal Medicine) from the prestigious institute, PGIMER, Chandigarh followed by super specialization for three years in Cardiology from the world famed, AIIMS, New Delhi. Dr. Arvind Kaul deals with all types of cardiac emergencies and is doing diagnostic & therapeutic Interventional procedures such as diagnostic cardiac catheterization & angiography, coronary angioplasties with stent implantation including primary angioplasties with the use of thrombus extraction. He is also an expert in all paediatric diagnostic and Interventional cardiac procedures. ***Appreciate the level of hospitality and care provided by doctor including supporting staff. Am glad to get connected with Dr Arvind Kaul and would recommend to all whosoever is seeking a Cardiologist in the Tricity.